Crushes and self-ejects standard aluminum cans into large waste container. 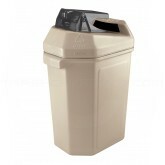 Perfect for home recycling needs, as wells as schools, offices, parks, or any recycling program. Easily crush standard aluminum cans with hand-operated crusher.